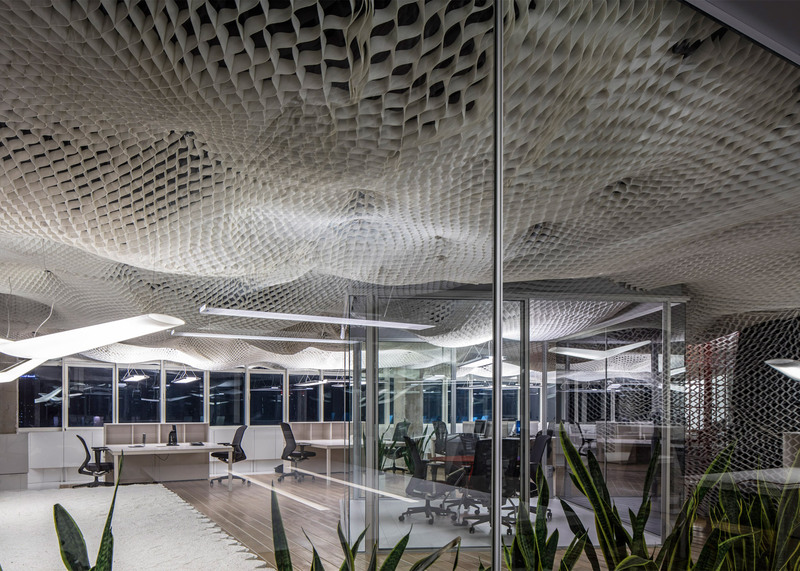 This web-like material called geocell is typically used to stabilize the ground under roads and other infrastructure, but at the headquarters of the company that manufactures it, it becomes a beautiful cloud-like ceiling installation. 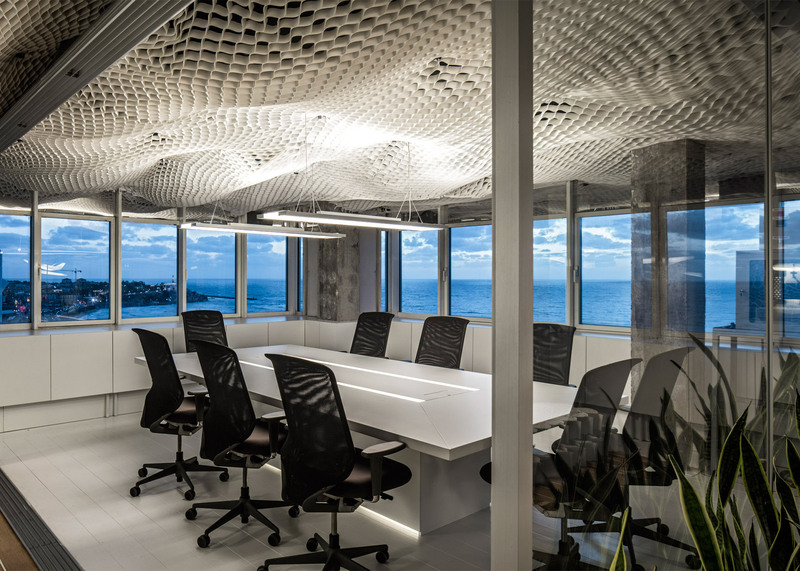 Tel Aviv-based engineering company PRS literally surrounds its corporate team with the material that forms the foundation not just of construction projects around the world, but their business’ success. 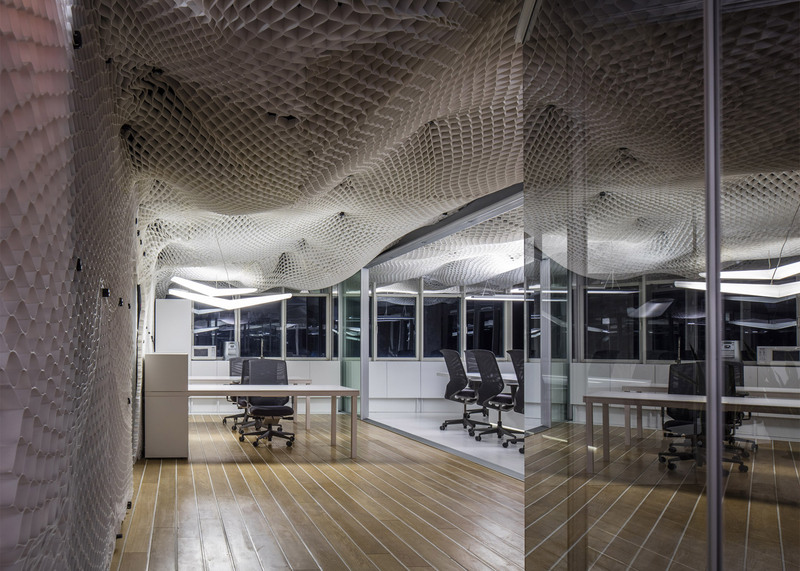 Designed by Paritzki & Liani Architects, the installation makes use of geocell’s malleability in a curvaceous display running throughout the entire 12th floor office at the Sharbat Tower high rise. 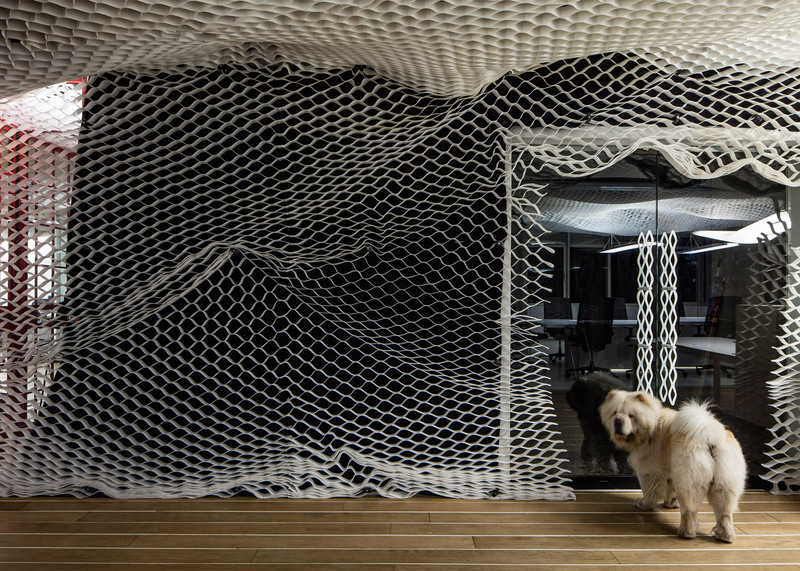 The openings in this plastic webbing change dimension as the material is stretched and formed. 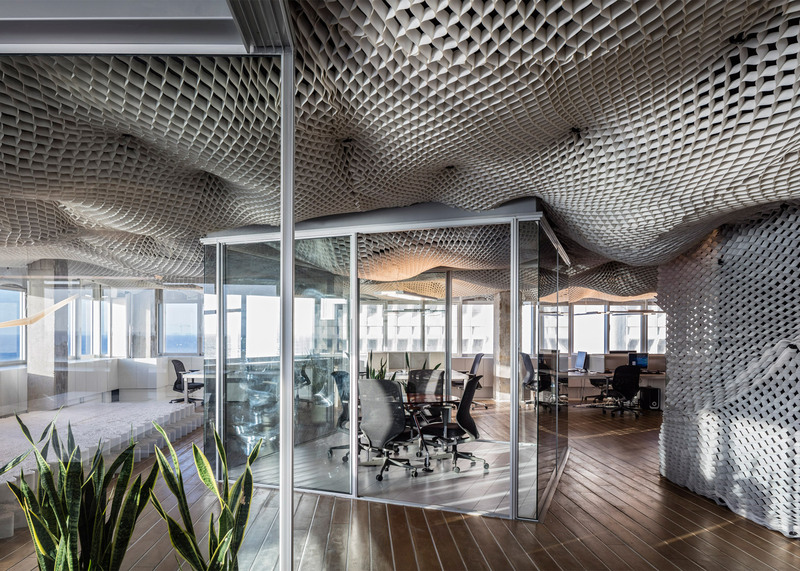 In this case, Paritzki & Liani simply suspended sheets of it from the ceiling, tacking it up in some spots and letting it hang in others to create an organic effect mimicking the look of clouds. With the office’s glazed walls looking out onto the landscape far below, the visual effect seems to make the world outside an extension of the interior, with these solid clouds merging into the gaseous ones in the distance. 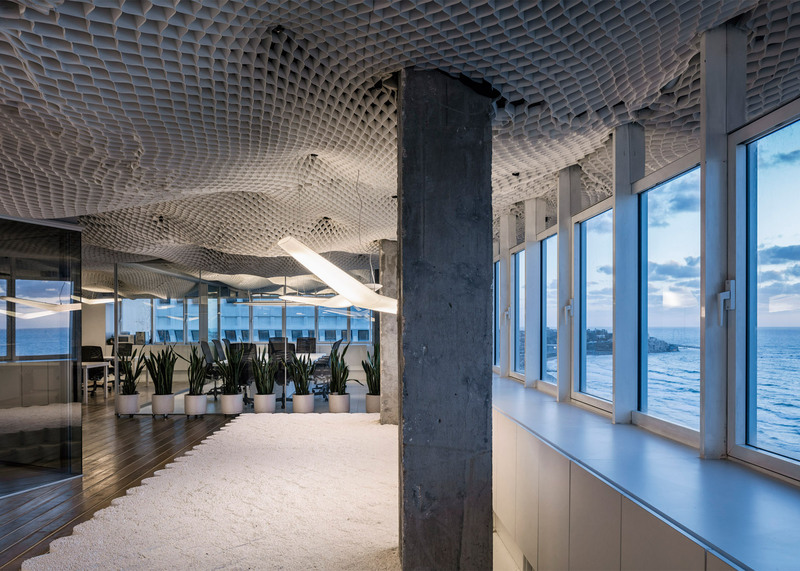 They even continued the netting down onto some walls as privacy curtains, adhered it to door handles and used it as the main material of a “relaxation island” filled with small white stones. 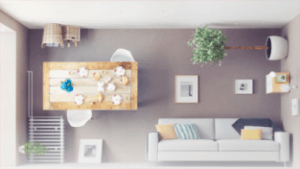 The idea is to “filter and mediate” the panoramic view of the city. Though the geocell concept was first developed by the US Army Corps of Engineers back in the 1970s, PRS manufactures a specific variety called Neoweb, made of a novel polymeric alloy that enhances its tensile strength for better dimensional stability and reinforcement. Newell is considered a sustainable solution for road construction, since it enables the use of locally available soils that might not normally be the right texture for use under roads.